This weekend, multiple stories of the Regency Ballroom (a San Francisco architectural treasure) will be transformed into an amazing fantasy steampunk Edwardian wonderland inspired by the literary and artistic eccentricites of the great Edward Gory for the world-reknowned Edwardian Ball. There is nothing like it anywhere. It is one of San Francisco’s signature events. Fans come from every continent to dress up in Edwardian clothing, steam punk fashion, and costumes inspired by the drawings of the great Edward Gorey as they dance the night away amidst an unending cornucopia of circus acts, steam punk machinery, vendor bazaars, burlesque performances, top flight musicians and more. Costumed revelers at The Edwardian Ball. Photo Credit: edwardianball.com. First inspired by the writings of Edward Gorey back at the turn of the 21st century, The Edwardian Ball is the brain child of the literate and eccentric music ensemble Rosin Coven. Later, Rosin Coven was joined by circus artists, the Vau de Vire Society. The event actually features two extravaganzas: on Friday night it’s “The Edwardian World’s Faire” which features an incredible carnival of steam punk machinery, and on Saturday it’s the formal “Edwardian Ball” for seriously dedicated ballroom dancers. Both nights are spectacles not-to-be-missed. The culminating event on Saturday night is an interpretive performance, created by the Vau de Vire Society and Rosin Coven, of the Gorey short story, “The Curious Sofa”. Want to know more? Here is an interview conducted two years ago for “Storming Bohemia” in which the founders detail some of the event’s history. 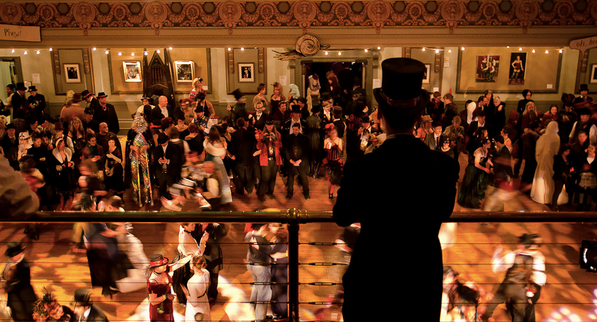 Note this: The Edwardian Ball will almost certainly sell out! Act now to obtain tickets. You won’t regret it.